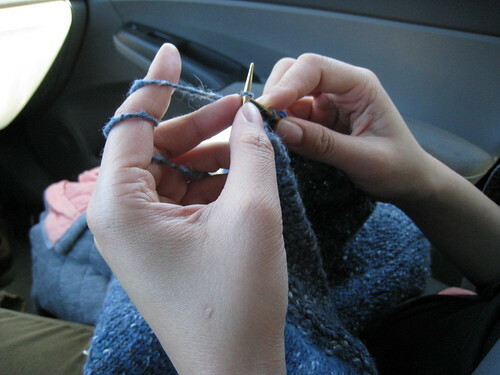 Knitting in the car on the way to Montauk. I mean, if I can knit a pair of socks, you would think I would be able to learn enough coding to modify my own blog, right? Well, I was doing okay, and even changing colors in templates and such, but then I realized that my new chosen theme was not accepting my Flickr WordPress widget to create thumbnails and I had a little bit of a mind meltdown. So I went to bed. But I did have to give myself a pep talk. I realized that reading knitting directions are a kind of separate language, and I can read music and speak four human languages (badly, but enough to be able to buy food and find the bathroom, and that’s all that matters), so I should be able to understand PHP. And many many years ago, I did take deductive geometry, though there was a minute when I was scanning the “if…then” code that I was like, “Why can’t computer programmers use regular English!?!? !” But then I realized it would be like if knitters wrote out all of their instructions (“knit by creating loop and pulling through, repeat, purl by creating loop in front, repeat” instead of “*k1, p1* repeat until end of the row”), that it would take too long. Cascading style sheets, I will conquer you. Also, I spent all morning trying to read legislation to figure out how to get the new COBRA subsidy. Dear President Obama, please create a legislation FAQ for dummies on your homepage. Thanks. Yeah, I was wondering what all those wacky typefaces and “Know Your Rights, Exploited Worker” booklets were about. When I came to New York Minknit the other night and saw an entirely different design, I thought either I’d had one too many Red Bulls or else I’d slipped through an expansion joint in the space-time continuum and landed in an alternative universe–a sort of wimpy one, where everything is basically the same but differs in some minor detail. Also I’m pretty sure there’s a NY State COBRA subsidy too . . . I do lots of HR work at my day job so if you want help let me know! PHP and CSS are entirely different! It’s like PHP is the knitting pattern and CSS would be the kind of yarn you want to use. You have to have a basic understanding of both if you really want to customize your blog’s theme and make it your own. With WordPress, you’d probably need more understanding of CSS than of PHP. If you look at the page templates in WP with a minimal knowledge of PHP, you can sort of see what it’s doing, and as long as you don’t futz with the PHP code, you’ll be fine.